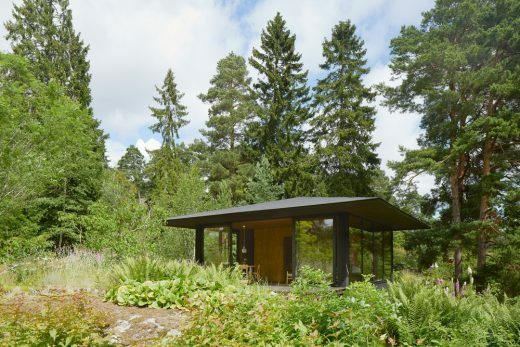 The small house is situated by a lake in the Stockholm archipelago, on a site that in the early 1900s was inhabited by a gardener. Plants and paved walls that were then organised still remain to a large extent today. For the last 25 years another garden interested family have used the old existing house as a summer home. The family, consisting of mother and two daughters, has grown in recent years when the two daughters have formed families on their own. That in turn has made more space necessary. 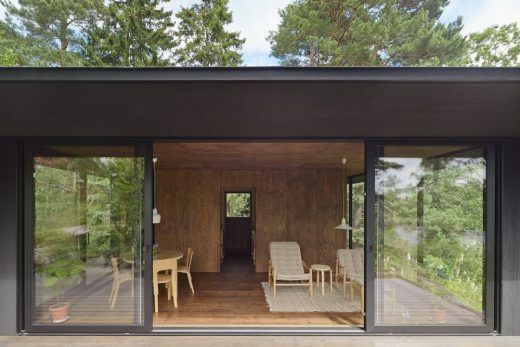 One sister has renovated an existing guest house, while the other sister decided to build a new small house, Summerhouse T, for her family consisting of two adults and two children. 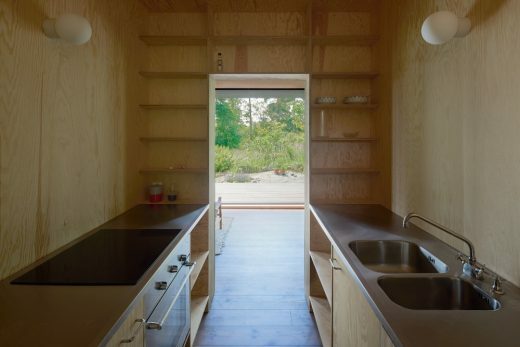 The family formulated a program that included a kitchen, bathroom, dining area, living room, four beds and room for storage. While municipal constraints did not allow a building that exceeded 40 sqm. 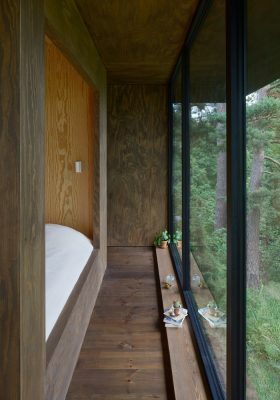 The architects created a large open square room with a standalone volume containing the beds, kitchen and storage. Along the buildings southern side is a dining area and a living area. 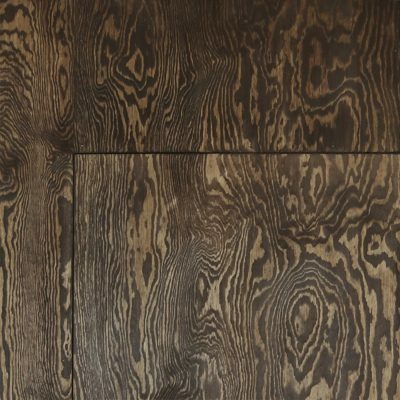 Roof, floor and walls have a dark colour to enhance the building’s intimate character and direct the eye towards the surrounding view. 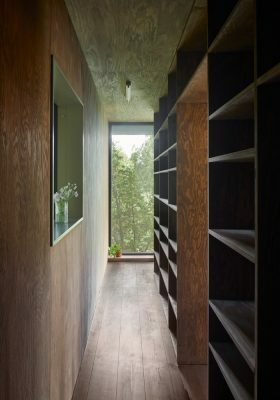 The house’s only (trap) door leads to the bathroom, a separate volume which design was adapted to fit into an existing gap in the nearby rock. The open organization with ceiling high windows create a surprisingly large number of different spatial experiences. 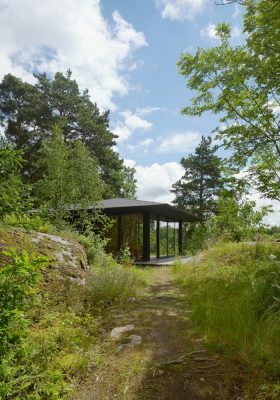 Freedom of movement along the entire facade gives a feeling that the house is larger and more spacious than it in reality is. 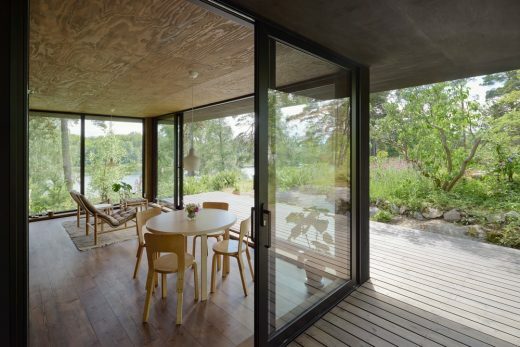 The parents’ sleeping area has a view towards the countryside and the lake while the children’s more enclosed sleeping alcove directs the view towards the grandmother´s house. 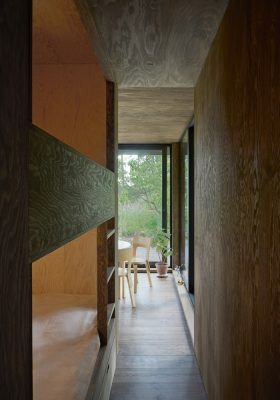 The storage passage at the back of the house opens up to the greenery outside at one end while the parallel kitchen has contrasting views in opposite directions. 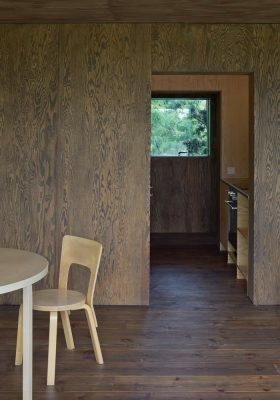 The living room with dining area and lounge, in turn, have a 180 degree view towards the surrounding. 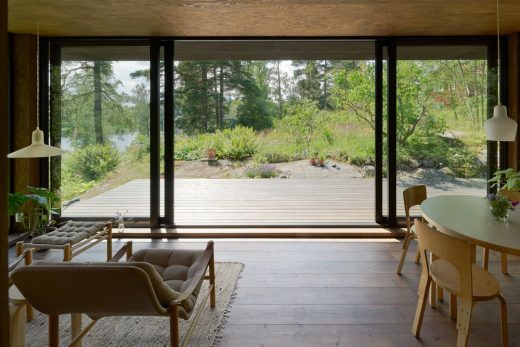 Two of the walls are sliding windows that on hot summer days easily opens and allow for a pleasant breeze through the house and at the same time extend the living area to the exterior, where the roof overhang provides protection against the sun. 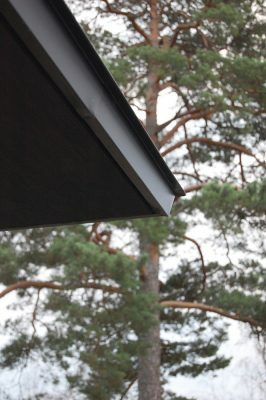 On rainy days, water runs along the eaves almost as physically present curtain and the house suddenly closes inward.